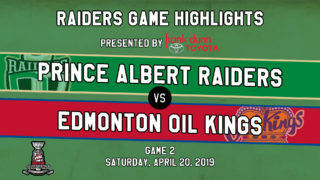 Prince Albert, SK – For the second consecutive outing, the Prince Albert Raiders (12-1-0-0) scored eight goals en route to a victory. 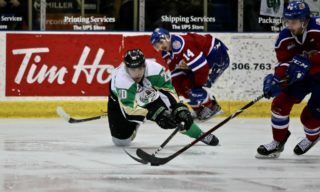 Sean Montgomery had a goal and two assists to lift the Raiders to an 8-2 win over the Spokane Chiefs (6-3-1-1) on Saturday night at the Art Hauser Centre. Jakob Brook and Noah Gregor also had multi-goal games. The Raiders opened the scoring 5:49 into the contest. Brett Leason fed Noah Gregor, who had got in behind the defence. The San Jose Sharks prospect broke in on net and lifted a backhand shot over the glove of Dawson Weatherill. About a minute later, recently recalled Konrad Belcourt got on the scoresheet for the first time as a Raider when his point shot got through Weatherill, doubling the Raiders’ lead. Zack Hayes increased the Raiders’ lead to three with 8:06 to play in the frame. Montgomery made a perfect backhand saucer pass to Hayes, who snapped a shot off the far post and in. At the end of the period, Aliaksei Protas made it a 4-0 game. The Belarusian rookie stepped out of the penalty box and received a pass from Jeremy Masella. Protas cut through the middle of the zone and wired a shot past Weatherill’s glove to put the Raiders up four after the first. It was more of the same to start the second. 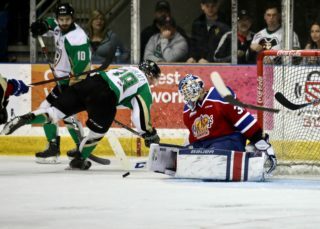 Sean Montgomery forced a turnover in the Chiefs end, broke in on goal and beat Weatherill to increase his goal-scoring streak to four games. The Chiefs cut into the lead with back-to-back goals. First, Nolan Reid’s point shot on the power play got through a screen and beat Ian Scott at the 7:18 mark. Then, on a delayed penalty call, Erik Atchison tapped in a goal at the side of the net to make it a 5-2 game after two periods. Early in the third, the Raiders took the momentum back. Brook broke in on the left wing and snapped a shot past Weatherill to restore the Raiders’ four-goal advantage. Near the end of the frame, the Raiders added two goals in 20 seconds to round out the scoring. Gregor finished off a beautiful three-way passing play with Leason and Parker Kelly by tapping in a pass from the crease. Brook found a puck that ricocheted off the post and buried it into the open side of the net. Scott picked up the win on the evening, making 32 saves in the process. Weatherill stopped 30 shots in a losing effort for the Chiefs. 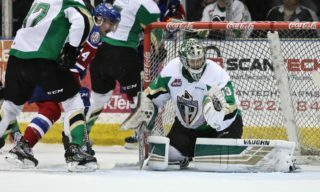 The Raiders welcome another team from the US Division to Hockey Town North on Tuesday night when the Everett Silvertips visit the Art Hauser Centre. 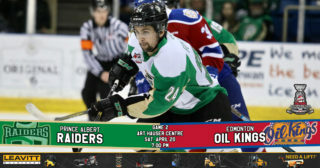 Puck drop is 7 p.m. Tickets are available at the Raider Office and at raiderhockey.com.